More than 26% of all websites online today from personal blogs to Fortune 500s companies like Sony Music are powered by WordPress. Today we are going to see the 10 best political wordpress themes of 2019. 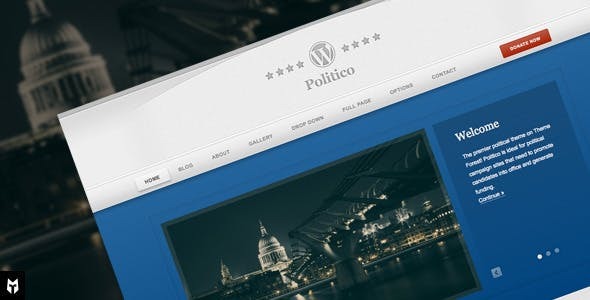 Politic is a premium quality modern and elegant political wordpress theme. It is especially suited for making fully responsive websites of politicians, ministers or different members of parliament. It has built-in king composer page builder plugin which allows easy to use drag and drop page builder functionality. The theme is also retina ready. It also has two home page versions, one of which is a one page version another is a multi-page version. You can choose from unlimited colour and font choices to build custom pages and post types with unlimited custom header and footer settings. Politic – Political WordPress Theme also includes custom widgets and Google map settings with also the ability to add 20+ different add-ons. This makes it extremely feature rich and user friendly to make any kind of political or social movement websites for organizations like NGO’s or crowd-funding campaign. Politic – Political WordPress Theme has tremendous features like video popups, social media feeds, slider content, special events section and testimonial sections each of which has the ability to be customized limitlessly without requiring any coding knowledge. All this is available at a regular license fee of USD 39. 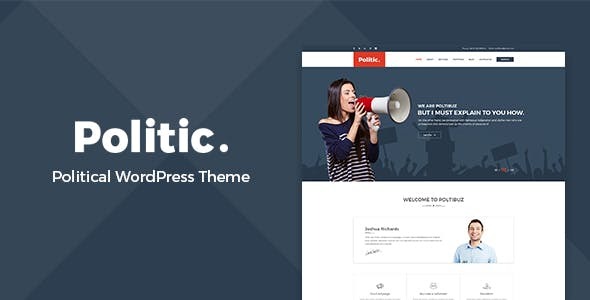 Politist is a clean and modern political wordpress theme most suitable for making websites of political leaders, political campaigns, political parties, etc. It has multiple features which include visual composer page builder, dedicated volunteers page, photo gallery section, WooCommerce support, visual composer addons, mailchimp integration, contact form 7, paypal support, full width layout and boxed width layout, 3 homepage variations, 3 menu variations, advanced SEO features, etc. It has so many awesome features that you will definitely want to try out this theme if you want a political website be it for a political campaign or political candidate. Politist is also 100% responsive and is cross-browser compatible and comes at a reasonable price of just USD 49 per regular license. It also has a free 6 months customer support with the regular license fee. 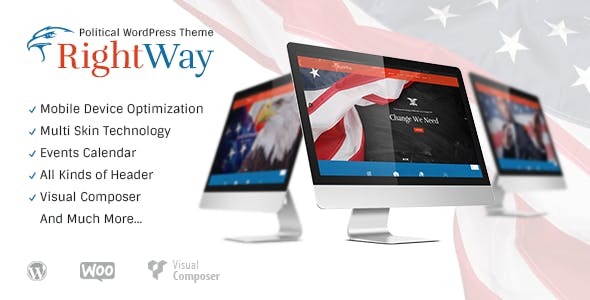 Campaign – Political WordPress Theme is a theme especially designed for you to win political campaigns. It is pre-packed with tons of features to help you win in your political race. This wordpress theme will be at the centre stage of your campaign and help you stay ahead of other competitors. It has many built in features and functionality like the WordPress email capture plugin which will collect the names and emails of your constituents on your behalf. It also has the events calendar plugin which will keep you and your constituents informed about your upcoming events. It is fully responsive and has an optional donate button in the header menu for easy donation collection. It has 2 distinctive body styles, boxed and full width, 4 different colour schemes, 6 unique background pattern options, 2 different content layouts – left and right and supports multiple languages with English and French translation files included. This means now you can easily campaign for your political race in any language you desire. It is well documented and is cross-browser compatible. 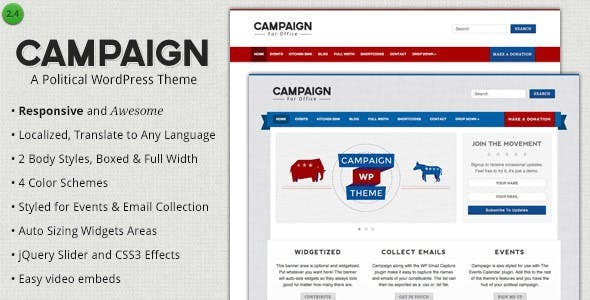 You can get Campaign – Political WordPress Theme for a regular license fee of USD 44. 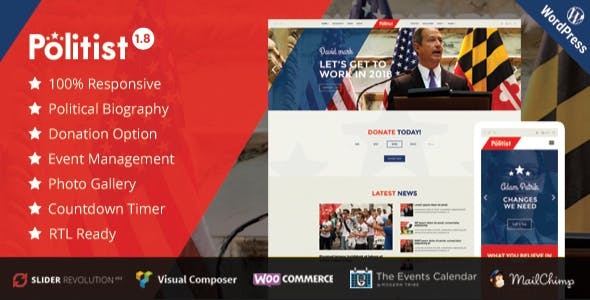 Politico: Responsive Political Campaign WP Theme is a fully responsive, retina ready and translation ready wordpress premium theme. It has a customizable “donate now” button and also a customizable election countdown button. It is one of the few ideal themes especially designed for political campaigns and has customizable banners which come in unlimited colours to draw attention to important issues of a particular campaign. It also has font awesome support and has free updates. This custom tailored wordpress theme for political campaigns is available for a regular license fee of USD 24. 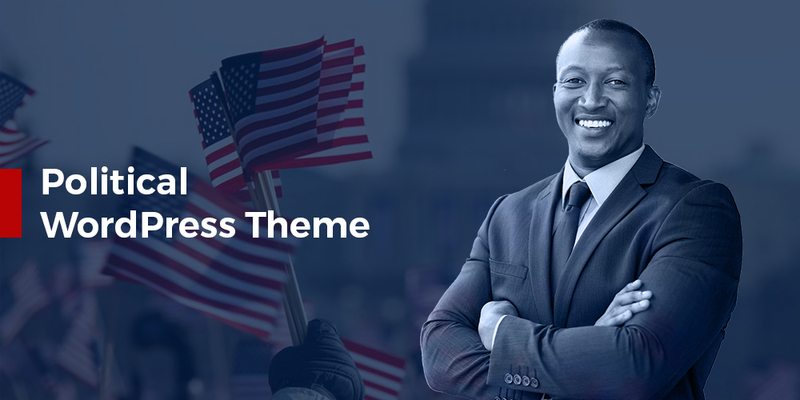 Candidate – Political WordPress Theme is one of the best political themes available. This is due to its easy, user friendly customization with unlimited page layouts. It is also woocommerce ready and comes with over 600+ google fonts. It has many features like unlimited colours, one click demo installation, upcoming events calendar which also has a countdown feature, slider revolution, and a dedicated donation system which can be set up in a few minutes in any desired location of the website. Since its woocommerce ready which means you can also sell items like t-shirts with political slogans through your website by using Candidate – Political WordPress Theme. 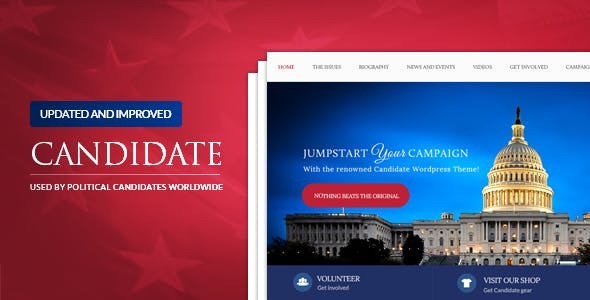 Candidate – Political WordPress Theme is suitable to be used for any political or grassroots movement website and is made specifically to user friendly and all the while not compromising on your ability to reach out to your supporters. It is also fully responsive and suitable for any screen size. It also has different page layouts for different uses like gallery, album, 404 page, etc. This powerful wordpress theme comes at a regular license fee of only USD 39. The Political WordPress Theme – FrontRunner is especially suited for making websites which are meant for political campaigns, different political candidates and different political parties or organizations. The FrontRunner wordpress theme is easily customizable with limitless designs for any political candidate. It has a variety of different yet powerful features like custom landing pages, Donation page, Event management page, video templates, YouTube integration, newsletter sign up, custom login page, etc. 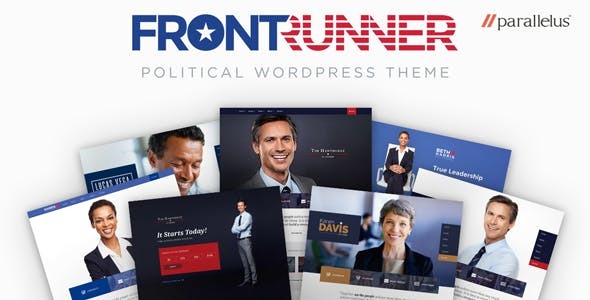 Political WordPress Theme – FrontRunner has a regular license fee of only USD 79 which makes it one of the best investments for any political organization or political candidate because of its affordable pricing and its set of powerful features. 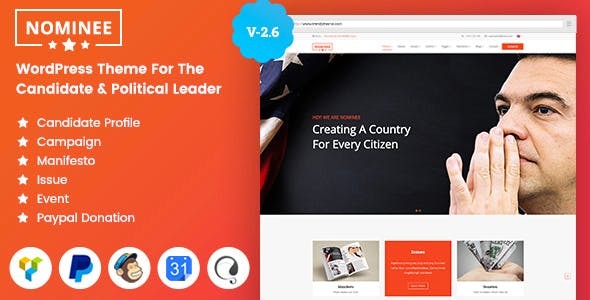 Nominee is a political wordpress theme specificially designed and developed to be used by any political leaders, political candidates, political organizations, and political parties or for any political campaigns. It is now available with updated 2 new home demos, slider revolution, and hundreds of powerful shortcodes which makes making your website easy and hassle free. It also comes with WPML plugin which makes it easy for you to make multilingual websites in wordpress with distinctive pages and categories in a variety of languages. It can also be customized for other causes such as non-profit organizations, charity events or social campaigns, etc. It has 4 different Home Page, 4 different layouts – full width layout, box layout, frame layout, and full width box layout. Nominee also comes included with biography page, video gallery, unlimited preset colours, advanced typography, visual composer page builder, mailchimp integration, contact form 7 and excellent customer support. All this comes at a super reasonable price of USD 59 per regular license. Politica is a handcrafted political wordpress theme for use by political, campaign or election websites. It supports multiple plugin integrations such as WPML, Events calendar, woocommerce, contact form 7, wordpress mailchimp, social pug, etc. It is also fully responsive and retina ready with powerful theme panel. Politica also has the easy to use visual composer – page builder and woocommerce custom shortcodes. It was built by professionals for professionals and simplifies the task of building a world class political website. It is also perfect wordpress theme for non-profit and activism websites. Politica has more than 600+ google fonts and is exceptionally well documented and easy to customize. It also has multiple columns testimonials and clients slider with multiple options. 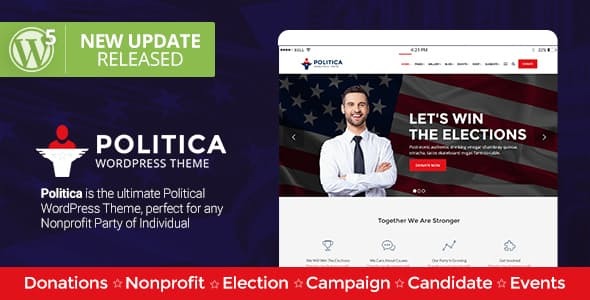 Politica has so many powerful features packed in one theme that it is undoubtedly one of the best available political wordpress theme and comes at a regular license fee of USD 59. Right Way is a multi-purpose, modern and elegant political wordpress theme which can also be used by human rights organizations, charity organizations, volunteering organizations, parliaments, political candidates of different regions of the world, etc. It can also be customized for use as a political magazine. It is feature rich and comes with 15+ homepages and different layout styles, a powerful donation plugin, over 80+ shortcodes and widgets, an event management system and events calendar. Right Way political wordpress theme is based on the powerful ThemeREX framework and WPBakery also known as visual composer page builder. It also comes with 40+ awesome hover effects and a variety of pagination styles such as page slide, button, load more, infinite scroll, etc. It also has many slider options such as swiper slider, royal slider, flex slider, revolution slider, etc. Right Way also has 3 distinct and different menu types which are upper menu, side menu, and custom panel. It also has WPML plugin integration making it multi-lingual and translatable to any language. It is also SEO optimized and browser-compatible. All these features are available for you at a regular license fee of USD 59 only. Miata is an exceptional, elegantly built modern wordpress political theme. It is extremely suitable for making websites of political campaigns, political candidates, political parties, etc. It is fully responsive and fully customizable to meet your desired needs. It has many essential features which include, 3 different home pages, 30+ short codes, 11+ custom elementor addons, unlimited colour variations, WPML support, progressbar addons, gallery addons, blog addons, Yoast SEO, bbPress, etc. All this exceptional features comes at a regular license fee of just USD 49. 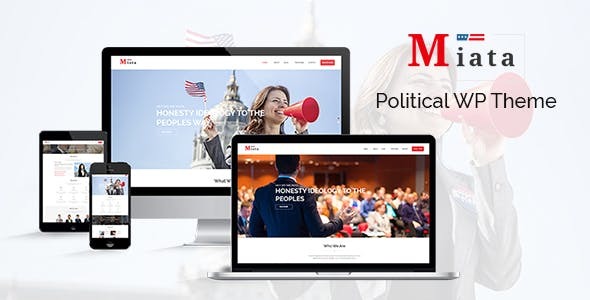 All the above Political wordpress themes of 2019 have been handpicked for their elegant, modern and exceptional performance and usability in making perfect political website or websites for social activism, fundraising or any type of political organizations, candidates or campaigns.